Draft electrical schematic of my van power distribution. Every system needs a schematic. Just like every paper needs an outline. And although one can build a tiny home or write an entire blog post without either, a schematic is where the construction of any system starts, regardless of who elects to skip the first step. A schematic is flexible and serves a specific purpose, allowing someone to see broad elements required to complete a goal. When developed properly, a schematic (and outline) can be given to a third party and be completed in the broadest sense. Although there are often finer details about the materials of construction that need to be selected by the designer (writer). In the most basic form, general components (chapters/sections) in the schematic (outline) are connected by a conduit (pipe, wire, duct, paper). Components often will have their own separate detailed schematics (sub-sections). In any given form, a schematic may or may not show the entire functioning system on a single page, and the individual components may or may not be spatially aligned. Most don’t think of engineers as “having a way with words”, but I could reasonably argue that a proper paper outline more closely resembles an engineering exercise than anything else. Throughout this van build project, several areas gave me pause; some more than others. I spent hours trying to envision the ceiling framing in relation to the driving cab partition. I spent hours trying to figure out where to put a propane tank, water tank, and waste water tank. And I’m still in a bit of a stall about the waterproof materials to use for the bathroom floor and walls. In this post I’ll cover my struggle through the electrical schematic. My van has a primary power resource, with three means to recharge. My primary power resource is a battery system of two (2) 12V batteries connected in parallel. The 12V batteries are each actually comprised of two (2) 6V batteries combined in series (which was decided based on advice from electrical engineers). A starter battery isolator diverts excess electrical current generated by the vehicle's alternator towards an auxiliary battery system. This device acts as a one way valve to ensure the vehicle starter vehicle has priority and remains charged. While this device might seem like a complicated luxury, I've come to accept that a starter battery isolator is actually the place to start when powering an auxiliary battery system (like my tiny home inside the van). They are cheaper than solar means of charging and self contained because they rely on the excess power a vehicle is already generating while running. There are two (maybe three) types of van battery isolators. Diode types require a connection from the starter battery and alternator while a solenoid/relay type requires a connection from the starter battery and some power source which is only powered when the ignition switch in the vehicle is in auxiliary or running. A third-ish type is a "smart" isolator which a solenoid type that requires only a connection from the starter battery and estimates the running status of the vehicle by measuring a voltage difference on the starter battery. I purchased the linked "smart" battery isolator because of the simplicity. Re-routing the alternator wiring due to my starter battery placement under the driver seat was more of a nuisance than I want to deal with. Preparation for wiring this device was actually one of the first items built into the van. 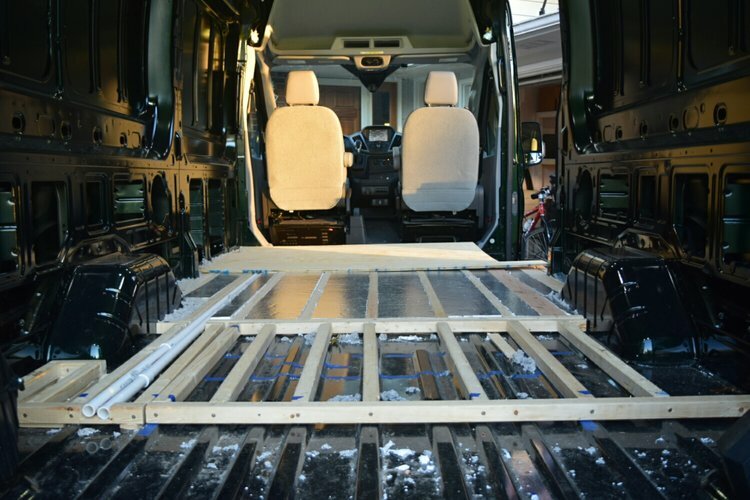 The empty PVC pipes shown in the picture below were built into the floor from the very beginning to allow wires to be run from the starter battery underneath the driver seat all the way to the back of the van where the house batteries are kept. The commonly familiar way to recharge my battery system is solar power. Three (3) 180W solar panels are mounted on the roof of my van. They convert the Sun's energy to direct current. But in order to efficiently manage the flow of current to the batteries, a solar charger is required. The little black box below is the solar charger which controls the charging pattern in ways I don't yet fully understand. The white box below is a battery monitor, which is the visual interface, a way to look into and manage what the charger is controlling. I could write an individual blog post just on the solar setup. But I can't just yet, because I don't quite understand it enough myself. "Shore power" describes a source of AC power from a fixed site (an RV park or a boat dock). An RVer will simply plug their mobile home into an external junction box with a heavy duty extension cord. They typically have access to power in three forms: 20 amp, 30 amp, or 50 amp service. Each current has a different outlet connection type and corresponding cord diameter. The typical RV service is 30 amp, but larger RVs which need to power multiple air conditioning units or appliances rely on 50 amp service. Batteries run on direct current. Therefore, before "shower power" can be used to charge my batteries, AC needs to be converted to DC. The way I am converting AC to DC is through a combined device which can convert AC to DC but also invert DC to AC. Like the solar charger, the inverter/charger has a separate connected visual interface to manage operation. The device pictured above is >40 lbs and gets hot (up to 194 degrees F). The size and heat considerations of this device alone gave me significant pause while creating the electrical schematic. There's just no easy place to hide it. The exhaust from the device can't be directed closely at anything that would melt. In general the device needs to be separated from anything combustible (like wood). And the device can't get wet. What I initially and ultimately concluded is the inverter/charger should sit extended above the batteries, surrounded by metal and air. Often in van builds, much smaller inverters are commonly used and simply placed in a wooden cabinet or under a wooden bed. But these smaller inverters simply can't handle continuous current loading from an air conditioning unit, for this reason alone I had to use something much bigger than your typical DIY YouTuber. The reason I have a battery system to begin with is to use my van like a home. I'll have a TV, and a refrigerator, lights, fans, and air conditioning. There are pumps, and smoke detectors, and a lap top to power. These devices either require AC or DC power. In many instances a device can accept AC or DC. In order to power these devices I needed both a DC power center and an AC power center. DC devices are wired to a DC fuse box or breaker box which takes power directly from the batteries. I purchased the linked panel below. Breakers are preferable to fuses because they are reusable. However breaker boxes are more expensive. And because DC devices run at much lower currents and will be permanently wired, they are less likely to "break" the fuse. Therefore I saved the money and went with a fuse box. AC devices are wired to an AC fuse box or breaker box. I elected to go with a circuit breaker style panel because my AC devices are more likely to be plugged in and taken out sporadically and more likely to "break" the fuse. I purchased the panel below simply because it was pre-wired and had enough breakers for all of the outlets I could imagine using. When buying a panel, always remember the enclosure, they're often separate purchases. The schematic really comes in handy when wiring this all together. The schematic I drew roughly aligns the components in their permanent location. On the schematic is where I experiment with things like the wire size, breaker type, and position of items that's easy to forget about, like a shunt, bus bar, or battery switch (named items that I purchased are linked). Without a schematic putting this electrical system all together is a daunting task. But I'm struggling through it and in a position now to mock up everything I described. This weekend I will wall off the area in the photo below with temporary sheets of wood. Then I will wire the electrical components over the next couple weeks to test for fit and functionality. After that I need to take down the temporary wood sheets and build-out non-combustible surfaces around the electrical components due to electrical heat considerations. And then, put everything back together in it's final location. The electrical schematic is still a draft but I'm struggling through it and nearing the end.